After a few more hours of sleep, we decided to start the day visiting Chenghuangmiao (City Gold Temple) in the Old City to see the Yu Yuan Gardens. Thanks to my guidebook, we never made it to the actual Chenghuangmiao because I was confused and thought the shopping plaza around Yu Yuan was called Chenghuangmiao. I didn’t realize that there was an actual temple. Oh well. 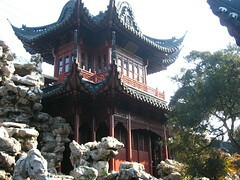 We first went to the beautiful Yu Yuan Gardens. It was the first of many Suzhou style gardens on my trip. In comparison to the others, it was not as elaborate, well maintained, or big in size. 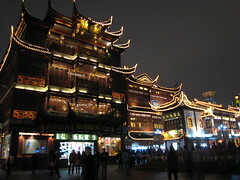 Then we walked around the two-story, retail tourist trap complex with stereotypical Chinese buildings. This retail part of the Old City is filled with souvenir vendors, western snack shops such as Starbucks and McDonalds, sub-par, over priced Shanghai street food and droids of tourist following the leader with a flag on a stick. Even, Nanxiang Steamed Bun Restaurant (aka. 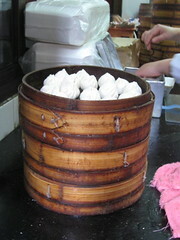 soup dumplings), situated in the middle of the Old City, seemed like a tourist trap. I’m not one for falling into tourist traps, but I was there and couldn’t resist a restaurant chain named after a city that created the famous soup dumplings. 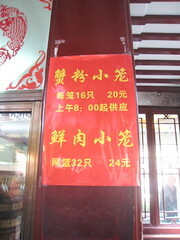 Nanxiang Steamed Bun Restaurant is a three-story building. There is a take out window on the 1st floor and dinning rooms on the 2nd and 3rd floors with higher quality dumplings at a higher cost. Due to our time constrains, my parents decided to order from the take out window. Dumplings are a snack anyways. We stood in line around 2 pm and waited about 20 minutes. There is no English menu. Luckily my mom reads Chinese! 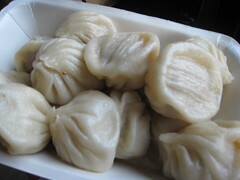 We ordered 2 trays of the crab/meat dumplings at the 1st window and received the dumplings at the 2nd window. Don’t forget to grab the chopsticks and add vinegar before hungry people mob you. Crab Dumplings - The skin was soft, but too thick, starchy and oily. It looked greasier than McDonald’s fries. When I bit into the dumpling, I found a generous amount of meat and only a small amount of crab. Also, instead of the usual burst of soup, I only tasted a bland squirt. Disappointed. Maybe the 2nd and 3rd floors do serve better dumplings. 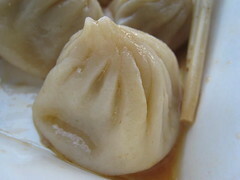 I am grateful that Nanxiang created the soup dumpling, but happy that other restaurants have improved on it. Now, that I’m done with this tourist trap, I’m off to find better soup dumplings.